IBM® Security Access Manager is a modular, integrated access management appliance that helps secure access to web, mobile, and cloud workloads. It is offered both as a physical appliance and as a virtual appliance image that runs on several popular hypervisors. The integrated appliance form factor enables easier and more flexible deployment and maintenance. 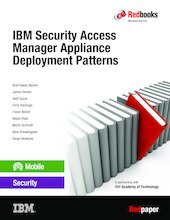 This IBM Redpaper™ publication describes the different Security Access Manager Appliance V9.0 deployment patterns and uses hands-on examples to demonstrate how to initially configure systems in those deployments. It also describes various deployment considerations, such as networking, high-availability, performance, disaster recovery, and scalability. All of these deployment patterns are covered within the context of realistic business scenarios. This paper is especially helpful to Security Access Manager architects and deployment specialists.